Provide comfort for the family of Roy LeClaire with a meaningful gesture of sympathy. Roy W. LeClaire, 79, passed away April 8, 2019 with his loving family by his side. He was born July 5, 1939 in Hartford, son of the late Harry and Viola (Rowe) LeClaire. Roy served in the U.S. Navy aboard the U.S.S Gearing. He married Maureen Nolan in September 1960. Roy worked at Mt. Sinai Hospital for 18 years. He was Director of Engineering for 11 years. Additionally, he was Director of Plant Operations at The American School for The Deaf. Roy was one of the first members of the Barkhamsted East Fire Department and actively served for 46 years. He was Chief for 13 of those years. 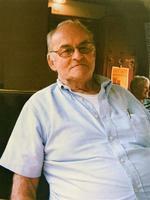 Roy served the Riverton Fair Association for over 25 years, assisting facilities. During his life, he was an avid hunter and fisherman. He also enjoyed traveling the United States, especially the U.S.S Gearing reunions for 28 years. Roy was a jack of all trades and was always willing to help anyone in need. Besides his loving wife of 58 years, Maureen, he is survived by his sister Dorothy (Joe) Eaton, his sister Diane Wadsworth, brothers-in-law Roy (Christine) Nolan and Ken Jones. Roy is survived by his 5 children: Michelle (Mark) Emirzian, Michael LeClaire, Cheryl McCabe (Ron), Amy (Sean) O’Toole, and Stephen (Holly) LeClaire ; his grandchildren: Jaclyn Dombrowski (Geoff), Natasha Koscak, Kevin and Shianne LeClaire, Collin (Chelle) Keats, Kendra (Tera) Giesinger, Amanda and Nicholas O’Toole; his great-grandchildren: Stella Dombrowski, Parker Smith, Nolan Giesinger, and many nieces, nephews, and cousins. He is pre-deceased by brothers Harry Jr. and John, and brother-in-law Robert Wadsworth. A Celebration of Life will be held on Friday, April 26th at the Barkhamsted East Firehouse, 54 North Canton Road, Barkhamsted, starting at 3:00 PM. Please share your memories of Roy. Donations may be made to Barkhamsted East Fire Department. Please visit Roy’s “Book of Memories” at www.vincentfuneralhome.com for online tributes. We encourage you to share your most beloved memories of Roy here, so that the family and other loved ones can always see it. You can upload cherished photographs, or share your favorite stories, and can even comment on those shared by others.